San Antonio’s up-and-coming community with a vision as BIG as Texas. A state of being where you can create the life you want. Open to anyone looking for a place to call home, further their career, get educated, or have some fun. The San Antonio native looking to jump into a different career. The Texas transplant who wants a new community to call home. The family with memories to be made. The student who dreams of more. Brooks is for you. Brooks is a 1,308-acre community where more than 3,200 people live, work, learn, play, and stay. It’s all possible, and it’s all happening at Brooks in San Antonio. It’s not just about where you live. To Live Brooks is to embrace the future. People who call Brooks home, who are building their careers at a nearby company, who are choosing schools that are customized for them—these are the people who are getting in on the ground floor of something big. 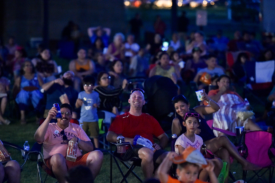 Formerly an Air Force Base, Brooks is now an open community with a mission to benefit the economic development of San Antonio’s South Side and preserve our rich history. Brooks has a legacy of greatness, and we’ve built on that to reach even greater heights. The sky’s the limit for the people who Live Brooks.